Why it matters: Samsung's year-end flagship is now official and it's the most desirable Note to date. It's also one of the most expensive smartphones on the market with the large-capacity model commanding an eye-watering $1,249.99. With noteworthy improvements like a big battery and a multi-purpose S Pen, however, some will have no problem paying to play. Samsung on Thursday at its Galaxy Unpacked 2018 event in New York City officially unveiled its next flagship smartphone, the Galaxy Note 9. The new phablet features a 6.4-inch display Quad HD+ Super AMOLED display operating at a resolution of 2,960 x 1,440 (516 PPI) although oddly enough, Samsung says the phone is set to a default resolution of Full HD+ but can be changed to Quad HD+ in the settings (my guess is for battery management purposes / improved performance in games). Under the hood is a 10-nanometer octa-core processor (either a Snapdragon 845 or Samsung’s own Exynos depending on your region) alongside up to 6GB of RAM and 128GB of local storage or 8GB of RAM and a whopping 512GB of storage. Both configurations afford a microSD card slot that can accept up to 512GB cards so in theory, you could get 1TB of local storage with the 512GB configuration and a 512GB card. The Note 9 features a dual rear-facing camera array with a wide-angle 12-megapixel shooter (with dual aperture f/1.5 and f/2.4 lens) and a 12-megapixel telephoto camera with f/2.4 aperture. Both offer optical image stabilization. Up front is an 8-megapixel camera with f/1.7 aperture for selfie needs. Samsung’s latest also packs a sizable 4,000mAh battery with Fast Charging and wireless capabilities and will ship running Android 8.1 Oreo. It also carries an IP68 dust and water resistance rating meaning it can be submerged in up to 1.5 meters of fresh water for up to 30 minutes. It wouldn’t be a Note without the S Pen and this year’s iteration really impresses. That’s because you can use the S Pen as a wireless remote control for the Note 9 via Bluetooth. Want to snap a selfie? Simply set the phone up, step back and use the S Pen to wirelessly trigger the camera. You can also use the S Pen to play or pause YouTube videos, flip through slides in a PowerPoint presentation and more. Samsung during its presentation trotted out Epic Games CEO Tim Sweeney to announce that Fortnite Battle Royale is now available on Galaxy phones in beta. It’ll be a Samsung exclusive until August 12, we’re told. For a full list of Fortnite-compatible Android devices, check out Epic’s website. 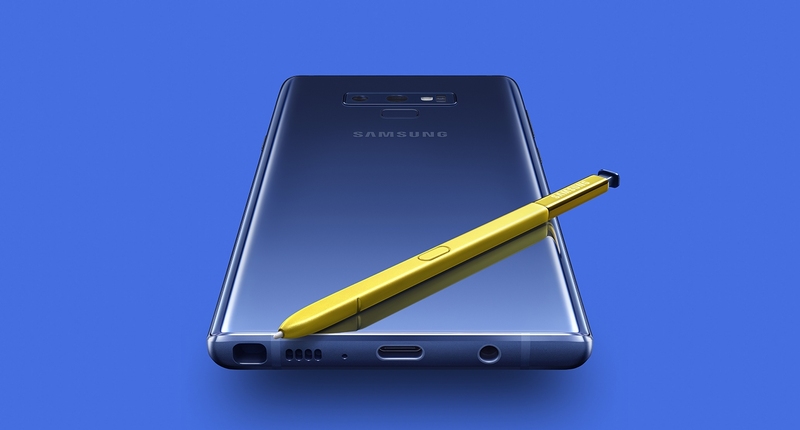 The Samsung Galaxy Note 9 launches on August 24 in select markets in your choice of midnight black, lavender purple, metallic copper with matching S Pen and ocean blue with a yellow S Pen. Samsung didn’t mention pricing but according to T-Mobile, the 128GB Note 9 will command $999.99 while the larger 512GB will set you back $1,249.99. Those who pre-order a Note 9 between August 10 and August 23 can score a free pair of AKG noise cancelling headphones or a Fortnite Galaxy skin with 15,000 V-bucks. More details are the offer can be found on Samsung’s promotional website.